How can a company win? One of the key criteria is to ensure good quality of its products and services. But the traditional testing and QC paradigm is not enough in the context of emerging technologies. It has proven to be inefficient: if some shortcomings are revealed, the product may have to be redesigned, requiring additional expenses and extra time. That is why something new is being executed in business — quality engineering solutions. Quality Engineering (QE) is the series of procedures by which software quality is analyzed and improved throughout the application or software development lifecycle. It differs from traditional Quality Assurance in that it prevents defects as well as discovers them. The QE approach implies that every single stage of the product/ software development cycle is under a scrupulous test of quality engineers. Furthermore, the quality maintenance is offered long after the product is delivered. The execution o such strategy in manufacturing or software development procedures guarantees the sufficiency of the output from the very start reduces imperfections, flaws, and reduces potential losses. In other words, quality engineering is the analysis, development, management, and maintenance of diverse systems compliant with high standards. What are the rewards of Quality Engineering? With Quality Engineering, the core benefit for your application development cycle is that you are actually making all the proposed advantages of DevOps and Agile more real. Also the teamwork between developers and testers is more real, more in line with the agile ethos. It is also integrated with Test Management solutions so that the outcomes appear on the dashboard instantly, without a human trigger. With shortened release cycles, time to ensure Quality also reduces considerably. Testers have to be involved at the start of the cycle as they will be setting up the testing environment and framework which will be relied upon for all future sprints. Done right, Quality Engineering offers a great deal more speed in testing. It mainly relies more on Test Automation than manual testing. It is hard to imagine a Quality Engineering function that doesn’t have Test Automation at its center. Yet again, done right, it creates more flexibility and speed for the whole development cycle. It is not considered just functional and non-functional testing, but every single layer and integration that can and should be tested. Create frameworks & accelerators that help scale QE across manifold channels, Enterprise wide. Quality engineering is driven by emerging technologies like AI (artificial intelligence), Big Data analytics and IoT. Automation is the driving force behind turning the traditional testing into an effectual quality support model. Performance of the application/ software is of paramount importance. Every outage, crash, drawbacks, and even slowing down of the app or processing/ working on a client request has the potential to impact revenue directly. It is the responsibility of QE team to not only identify such issues, but also work on identifying/removing the root cause of such problems. This demands a sound understanding of app architecture, monitoring tools, several enterprise sub systems that are catering to the app etc. Overall, Quality Engineering team provides substantial insights about the root cause or issue and solved it in the fastest possible manner. We live in an exciting time for advances in technology and with improved Smart-phone capabilities, wearable devices that can monitor our health, and virtual reality developments are some game-changing tech innovations that will surely impact the World in next coming years. Supersonic Jets that are going to cut Travel time by half- It is going to add substantial value to those who conduct business overseas, but could also spawn an age of faster planes that are twice as capable. Incredible fast Wireless Speed- Wireless speeds could go incredibly fast since it has to compete the world in order to keep up. Real-Time Universal Translation- No need to enter text also, we can eventually be able to use real-time speech translation for global use. Pills that could take for full UV protection-The sunscreen pills which we see today are only supplemental to sunscreen, but one day we are going to have a pill that we could take for full UV protection. Instant Delivery through Drones- If flying regulations for drones change, drone delivery could be implemented within a couple of minutes that can cost a minimal amount in our total bill. Foods with 3D Printing- Will eventually be able to produce fully cooked meals, no need to bake the dishes our self. It offers a range of potential benefits. It can be fine for the environs because it can assist to convert alternative ingredients like proteins from algae, beet leaves, or insects into tasty products. It also opens the door to implement food customization and therefore tune-up with personal preferences and requirements. Healings and changing the mood with Super Wearables- Now Wearables will promise to make us feel more calm or energized, will automatically measure calorie intake (through our skin). Robot Technology/ Artificial Intelligence- With advanced robotics science, we will be able to attend a meeting or work from home without lag and limited camera angles can have a discussion in person regardless of office space. Not only this, Social family robot can recognize the face of everyone to deliver messages to the right person at the right time; will change the lifestyle entirely. In testing department of today’s IT sector, Automation has a significant role. IT companies are leaning towards automation testing because there are endless advantages of automating an application. For programming language, automation gives flexibility. There are distinct types of frameworks that companies use for automating their applications. Some of which are mentioned below, and one of which is Page Object Model also popular as POM. POM is a type of framework which is very easy to understand and easy to implement while making architecture of any automation process. It basically enhances the test maintenance and reduces the possibility of duplication of code, which is very concerned thing in test automation. In other words POM is a structured base object repository design. In POM we create a page class for each corresponding web page in the application. Now, the page class that we have created contains all the web-elements of that page and also that methods that we will perform on those web-elements, so the name that we give to a method should be according to its functionality, for example- for a log-in page, the name of the method can be login() which only has few elements like user-name, password, log-in button, forget password link, etc. and methods like passing strings in the field and clicking the buttons. Create a new package file as Practice; we will be creating different packages for Page Objects, Utilities, Test Data, Test Cases and Modular actions. It is always recommended to use this structure, as it is easy to understand, simple to use and easy to maintain. 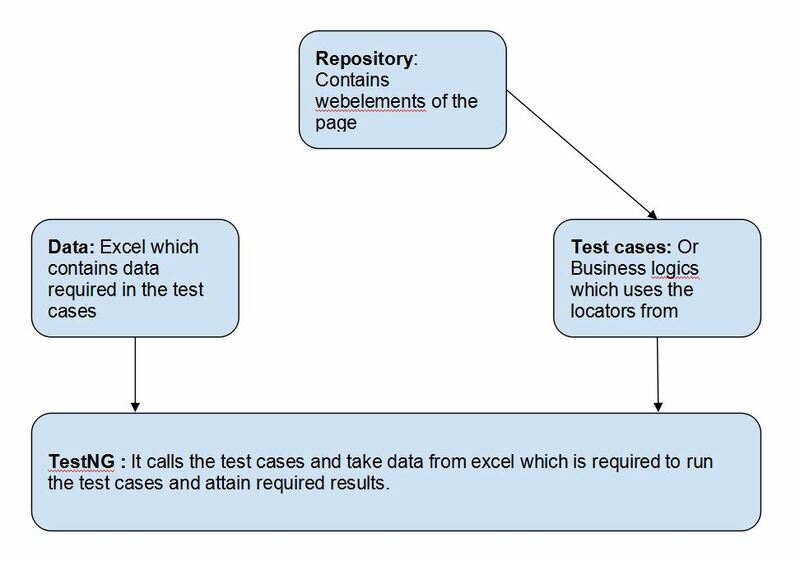 Create a new class file and refer the name to the actual page from the test object. In our case it is Home Screen and Login Screen. Create a static method for each element in Home Screen. Each method will have an argument (driver) and returns a value (element). 4.Reason of passing driver as argument selenium is able to locate the element on the browser (driver). Element is returned so that action can be performed on it. 5.Method is declared as public static so that it can be called in any other method without creating instance of the class. 6.Follow same rule for creating another class LogIn Screen. 7. Now create a new class which will be our test case, let’s say we are creating it in package called Framework by name POM. 8.You will notice that once you type HomeScreen in your test script and the moment you press dot, all the methods in the Home Page will display. We can expose methods in order to reduce duplicated code. We are able to call these method multiple times. This will ensure a better maintainable test code, because we only have to make adjustments and improvements in one particular place. **Implementation reference is taken from: toolsqa.com.